Fry was born in Liscard, near Wallasey in Cheshire. His father Ambrose Fry, a chemical manufacturer, later a property developer, was born in Canada, and his mother was Lydia (later called Lily) Thompson. He had two elder sisters and a younger brother. To his family and friends he was known as Maxi or Max. He trained at the Liverpool Institute and the University of Liverpool School of Architecture where he gained his Diploma in 1923. 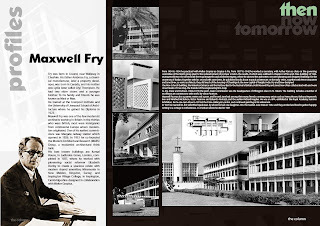 Maxwell Fry was one of the few modernist architects working in Britain in the thirties who were British; most were immigrants from continental Europe where modernism originated. One of his earliest commissions was Margate railway station which opened in 1926. In 1933 he co-founded the Modern Architectural Research (MARS) Group, a modernist architectural think tank. His best known buildings are Kensal House, in Ladbroke Grove, London, completed in 1937, where he worked with pioneering social reformer Elizabeth Denby to create a spacious estate with modern shared amenities; Miramonte in New Malden, Kingston, Surrey; and Impington Village College, in Impington, Cambridgeshire designed in collaboration with Walter Gropius. From 1934 to 1936 he practiced with Walter Gropius as Gropius & Fry. From 1937 to 1942 he worked as secretary, with Arthur Korn as chair, on the governing committee of the MARS group plan for the redevelopment of postwar London, the results of which were outlined in Chapter 4 of his work 'Fine Building', of 1944. During World War II he served with the Royal Engineers and worked in Nigeria, where he advised the authorities on town-planning and designed buildings for the University of Ibadan. Together with his second wife Jane Drew, he published books about tropical architecture. In the early 1950s, together with Pierre Jeanneret and Jane Drew, as senior architects, they did much of the housing of Chandigarh, the new capital of Punjab, India. Fry and Drew designed the New Schools building, the Waterloo Entrance and the Harbour Bar for the Festival of Britain. Both Maxwell Fry and Jane Drew often collaborated with and were close friends of Ove Arup, the founder of the engineering firm Arup. As Fry, Drew and Partners (1946-1973) the pair's major commission was the headquarters of Pilkington Glass in St. Helens. The building includes a number of modernist art commissions with works by Victor Pasmore. In 1927 he married his first wife Ethel Speakman, by whom he had one daughter, Ann. He married Jane Drew in 1942, and they worked and lived together happily, retiring to a cottage in Cotherstone, Co. Durham where he died in 1987.